Sears Modern Homes, ordered and bought from a catalog, came delivered in shipments via train, ready for assembly. From 1908-1940 Sears, Roebuck and Co. sold thousands of these home kits that eventually came in 370 different housing styles. Or, if preferred, a customer could design their own home and submit the blueprints to Sears who would then ship off the needed precut, fitted materials. The kits came with everything needed from instruction manuals down to nails and varnish and came in price ranges for everyone. Sears wasn't the first to offer these houses, but they became the largest. Rosemary Thornton has written several books about the mail-order Modern Homes sold through the Sears, Roebuck and Co. catalog. 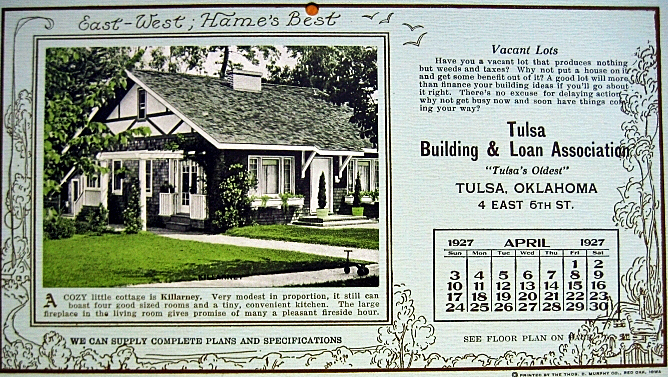 Another book, written by Rebecca Hunt, titled "Putting Sears Homes on the Map " cited Oklahoma as one of two states with no kit homes. Recently, Tulsan Rachel Shoemaker contacted Thornton to inform her that Oklahoma- Tulsa in particular- did indeed have Sear's homes. Several, in fact, as well as other kit homes. Tulsan's weren't living in tee-pees, although there were still some who rode on horseback. In fact, Tulsa had more automobiles per capita than anywhere else for a time because we had some of the wealthiest oilmen in the world living here. Men like Josh Cosden (who many estimated to be worth $50 million dollars before 1920), Warren G. Skelly, Waite Phillips, Harry Sinclair and J. Paul Getty (to name a few) spread their wealth all over our city in the form of philanthropy, building our Art Deco heritage, airports (in 1929 Tulsa had 4 airports), museums, housing additions and more. It is no surprise that many of our residents would have purchased kit-houses and had them built in some of our finest neighborhoods- Carlton Place, Brady Heights, Owen Park, Riverview and Buena Vista Park. No surprise at all. To see Rachel's (and Rosemary's) Tulsa finds, click HERE and HERE. 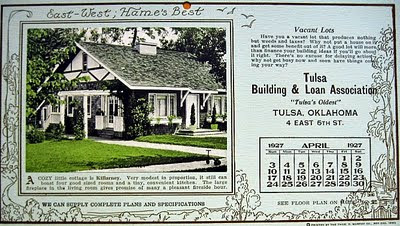 To read more about the history of Sears Modern Homes online, click HERE. For an index to Bungalow Floor Plans click HERE. Nice piece! :) However, it's a fact that Sears offered about 370 designs during their 32 years in the kit home business, and sold fewer than 70,000 kit homes - total. Sears was inclined to some serious puffery in their advertising copy, and that's where the "100,000 homes sold" came from - advertising copy. Actual sales reports from annual meetings prove that Sears sold about 70,000 houses - total. As to Tulsa, I was really surprised to find so many kit homes there. Rebecca Hunter's book - "Putting Sears Homes on the Map" is a compilation of testimonials from the old Sears Modern Homes catalogs, and those testimonials offer a representative sampling of where Sears Homes were sold! I hope people will start keeping their eyes open, as I'm confident that you have many more Sears Homes than Rachel Shoemaker and I have found, thus far. Thanks again for the piece. I'm always delighted to see these architectural treasures given a little recognition and appreciation! This is great. In fact my grandparents home, where Daddy grew up was a Sear's in a box house. It is on Main Street in Broken Arrow and houses a home health care business now. It has been many things over the years but a home no more. So sad. Jill- At least it's still standing though, right? I live in a Sears home ordered in 1932 in Bossier City, La. It was a duplex till I put a door between the side. My ex husband and I bought our first home at 2722 E Admiral Blvd. It was built in 1920 and was a Sears home. I-244 was in our front yard, but I fell in love with hard wood floors, sunken living room, and glass doornobs. We also had a Chandler gas stove that weighed 600 lbs and wouldn't fit through the doors so we couldn't replace it.